Philippine Constitution Association president Martin Romualdez on Monday paid tribute to heroism of the veterans of World War II, who fought for the country’s democracy. HONOR THE HEROES. 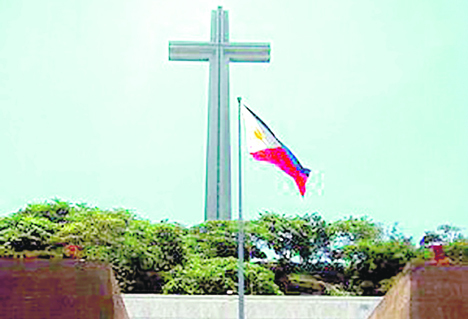 The celebration of Araw ng Kagitingan today has its limelight in Mount Samat, in Bataan 170 kilometers by road west of Manila, to celebrate the heroism, bravery, and commitment of Allies to preserve freedom against Japan’s Imperial Forces in 1942. “The democracy we have been enjoying was carved by blood on the pages of history because of their selfless dedication and invaluable service to keep our freedom alive,” Romualdez said. “We have to ensure a meaningful observance of Araw ng Kagitingan by always giving due respect and recognition to their heroism and to continue finding compassion inspiration, hope, and love to their greatness and patriotism,” he added. “Let’s remind our youth about their deep love for the country through their bravery and heroic services rendered for the country’s freedom,” said Romualdez, a three-term congressman from Leyte’s first congressional district who is running again for his previous post. Meanwhile, defense and military officials said Filipinos from all walks of life must be able to defend the country from all forms of threats if called upon. “As we remember our heroes, let us not forget that they put their lives on the line when they were needed and we must always prepare, just as we are doing in these exercises with our allies, for the day when our nations call us to action during disasters or when our freedom is threatened,” Department of National Defense spokesman, Arsenio Andolong, said in a statement Monday, ahead of the country’s commemoration of Araw ng Kagitingan (Day of Valor). Andolong added that this year’s “Araw ng Kagitingan” observance is made more meaningful as it coincides with the annual “Balikatan” exercises. “This year’s ‘Balikatan’ is more meaningful because it coincides with our ‘Araw ng Kagitingan’, which commemorates the courage and sacrifice of Filipino veterans and our Allies, who valiantly fought side-by-side to defend the Philippines during World War II,” he said. Some 4,000 Filipino, 3,500 American and 50 Australian troops are participating in the annual military maneuvers, which formally started April 1 and will end on April 12, while acting as observers are military personnel of the United Kingdom, Australia, Canada, New Zealand, Japan, Thailand, and Vietnam. Meanwhile, Armed Forces of the Philippines public affairs office chief, Col. Noel Detoyato, said the annual “Day of Valor” observance signifies the shared sacrifices of Filipino and American troops in World War II. “That was the start of the infamous Bataan Death March (140 km. from Bataan to Capas). Thousands died before reaching Capas, Tarlac,” he said. While honoring the sacrifices of these fallen troops, Detoyato said that Americans and Filipinos will be together again in this year’s “Balikatan” exercises. “Filipino and American soldiers will be together again in a different situation that is, delivering basic services, training together to prepare for calamities and shoulder to shoulder in the rigors of exchanging skills in anti-terrorism training and exercises,” the AFP official said. “Times have changed, but the camarederie is still as warm as ever, exemplifying the best of military diplomacy while remembering the heroism of our forefathers who gave the best of soldiery,” Detoyato said. AFP spokesman Brig. Gen. Edgard Arevalo, said this year’s “Balikatan” exercises is a good tribute to Filipino and American troops who have fallen in defense of Bataan. “This comes as a gesture to pay tribute to the heroism and indomitable courage of Filipino and American soldier-patriots as they fought side by side, shoulder to shoulder, against seemingly insurmountable odds,” he said. “To date, the friendship and the fight continues alongside one another in combating contemporary challenges of terrorism and in capacitating one another towards resilience to natural and human-induced disasters among other events of significance covered in the exercise,” Arevalo added. Earlier, AFP Chief-of-Staff, Gen. Benjamin Madrigal Jr., said the 35th iteration of the “Balikatan” is a testament to the Philippines and US’ enduring defense partnership. carrying the load together on our shoulder, however heavy the load, however huge the obstacle, and at whatever the cost,” he added. Underequipped and meagerly supplied American and Filipino forces, fighting in the Bataan front lines, were forced to surrender on April 9, 1942 after 93 days of resistance against the superior Japanese force. Some 60,000 Filipino and American troops were made prisoners of war by the Japanese. Meanwhile, representatives from the DND and AFP joined the 2019 Bataan Memorial Death March (BMDM) held at the dessert terrains of White Sands Missile Range in the US state of New Mexico last March 17. Defense Undersecretary for Civil, Veterans and Retiree Affairs Reynaldo B. Mapagu led participants from the DND and the AFP to the annual marathon honoring soldiers who served in World War II and suffered the arduous Death March. A record-high of 8,631 runners and walkers registered for this year’s BMDM, wherein participants were given the option to undertake the full 26.2-mile trek or the 14.2-mile honorary march. Before the event, the Filipino Veterans Recognition and Education Project (FilVetREP) held an awarding ceremony to present the US Congressional Gold Medal (CGM) to Filipino and Filipino-American World War II veterans. The awarding of the CGM to the veterans continues in the US and in the Philippines, pursuant to the enactment of the Filipino Veterans of World War II Congressional Gold Medal Act of 2015 in December 2016, which recognizes the service of Filipino forces under the US Army during the war.